So with February's end, I accumulated another 33 books for the year. I did just as well as January despite there being 3 fewer days. You can see the full list with my ratings on Goodread. I'm pretty happy about this though concerned about the challenge I've set up for myself in terms of trying to accomplish 365 books for 2013. Largely, because I know that March, April, and May (and then September, October, November, and December) will be busy months. However, I'm 66 books along in the challenge, so just 300 more books to go right? Let's hope. So for this month, I have the sadly distinguished accomplishment of not reading any physical traditional books. All of my reading this month for the list came in the form of audiobooks (14) and graphic novels (the remaining 19). However, in my defense, I think I should have a higher portion of traditional books read as I'm ab out 1/2 to 2/3 through about 6-7 books. And none of this reading accounts for any of the articles (journalistic and academic) that I've read this past month (classes started so I'm doing more of this too). So we'll see what March holds. 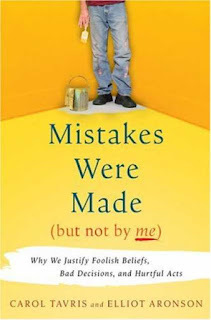 Beyond a doubt, Mistakes Were Made (But Not By Me) by Carol Tavris and Elliot Aronson was the best book of the month and thus far of the year that I have read. 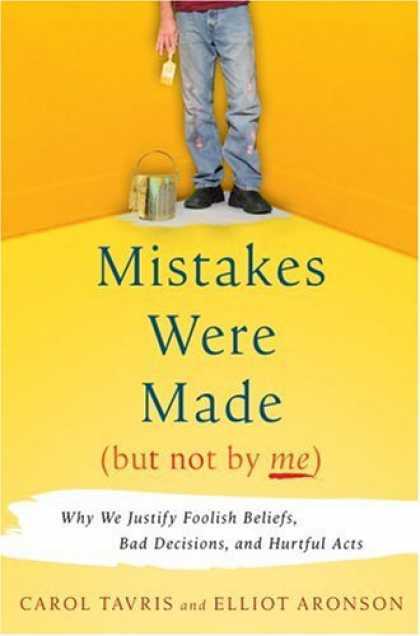 Like many of my favorite and most compelling books that I've read, Tavris and Aronson walk through an entire series of assumptions and misunderstandings that we have as individuals that generate the belief that we are correct, when we often are not or hold biases inaccurately present a reality that is unlikely to actually exist. I appreciate such books because I see it happen so much with others and myself. As individuals we hold a view of the world that is informed by our (limited) senses and influenced by others' views that we find ourselves predisposed to align with and thus make it extremely see beyond. The authors show a variety of ways that this consistently happens with humans and offers some help on trying to contend with this persistent challenge for humans. A runner up for another good read was Wiki Government: How Technology Can Make Government Better, Democracy Stronger, and Citizens More Powerful by Beth Noveck. Noveck's approach and view of the ways in which in the digital age government can be more collaborative than at any time before is pretty impressive. It reminds me also of Steven Johnson's Future Perfect. Given the nature of the last week of politics and the 2013 Sequestration, it's a timely book that should have all of us looking at the ways in which we can maintain the fundamental rights of the citizenry repair what increasingly feels like a broken system. All right, I need to get back to more reading I guess. Keep an eye out for my March reading list in a month and of course, my other posts along the way (really, you should sign up for the RSS feed or get an email when new posts are released--I mean, who doesn't want to read my miscellaneous writings on running, cats, and childfree living).